It’s Fall and our Forte is music! 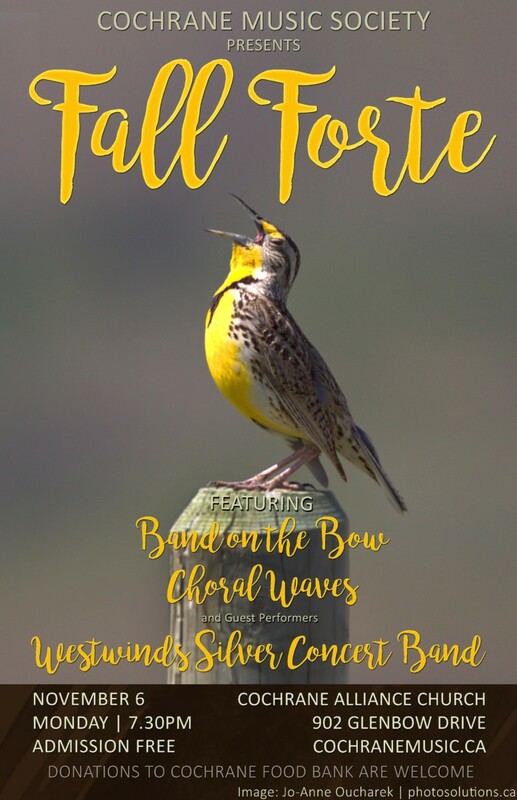 We are two months into our musical season and we want to share our fun and passion with our audience, and we are excited to invite Westwinds Silver Concert Band to the stage with us! Band on the Bow has chosen “river” repertoire to celebrate our historical CMS theme. Joined by Choral Waves and our friends from Calgary in the newly renovated Cochrane Alliance Church, this concert will be cool as a mountain stream. You can bank on it! Cochrane Music Society continues to collaborate with local visual artists by incorporating their art into our event advertisements. 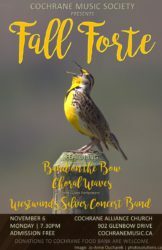 Thanks so much to Jo-Anne Oucharek (photosolutions.ca) who provided this magnificent meadowlark image for our Fall Forte poster.